On the cold, snowy morning of Dec. 19, 1813, Fort Niagara and the tiny settlement of Youngstown received a visit from some unwelcome guests: 562 British soldiers and Native allies bent on capturing the fort and revenging the destruction of Newark (Niagara-on-the-Lake) that had occurred just nine days prior. The force crossed the Niagara River near the present site of Stella Niagara and, by 4 a.m., began their march north along the portage road. 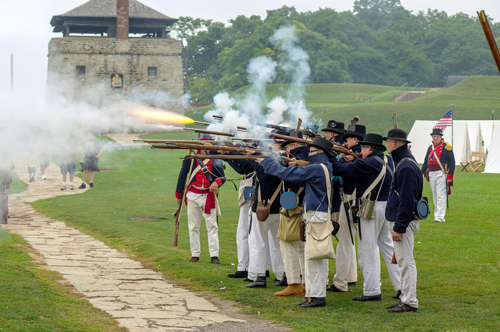 To commemorate the 200th anniversary of these dramatic events, Old Fort Niagara and the Village of Youngstown have joined forces to stage a series of re-enactments and educational programs on the exact anniversary of the attack. Re-enactors portraying British soldiers will charge the gates of the fort at 5 a.m. Thursday, Dec. 19, just as they did 200 years ago. Spectators will be able to watch the assault from a safe area, but they must arrive at the fort between 4:30 and 4:45 a.m. to be admitted. The re-enactment will be followed by a brief memorial ceremony. Admission is free. At 7:15 a.m., events will move to Falkner Park in Youngstown where re-enactors will light ceremonial flares and fire musket volleys as part of a brief public ceremony commemorating the burning of the village. This will be followed at 8:15 a.m. by two historical programs at St. John’s Episcopal Church on Main Street. The Niagara County Historical Society will present a PowerPoint lecture on the War of 1812 followed by a screening of “Niagara on Fire,” a video produced by the Niagara-on-the-Lake War of 1812 Bicentennial Committee. The video chronicles the Dec. 10 burning of Newark (Niagara-on-the-Lake) by American forces. Youngstown’s restaurants will be open at 6 a.m. to offer a hot breakfast to the hardy attendees. At 9:30 a.m., about 650 students from Lewiston-Porter, Wilson, Stella Niagara and Tuscarora Elementary will arrive at Fort Niagara for a special school program illustrating the 1813 capture of the fort. Interpreters in period uniform will describe how the fort was captured and demonstrate the weapons and tactics employed in the attack. By 11 a.m., the students will be bussed to four learning centers in the Village of Youngstown, where they will experience everyday life in the 1812 era and learn about such topics as Fort Niagara’s 1812 flag, 1812 lifestyles, music, writing, maps, surveys and military life. The students’ field trip will conclude with a screening of “Niagara on Fire” presented by the Niagara-on-the Lake War of 1812 Bicentennial Committee. Student programs will take place at the Youngstown Village Center (Red Brick School House), St. John’s Episcopal Church, The First Presbyterian Church and St. Bernard’s R.C. Church. The event is underwritten by the Niagara 1812 Bicentennial Legacy Council through the Niagara River Greenway Commission and the Niagara County Host Community agreement. Other supporters include the Niagara Falls National Heritage Area and the Niagara Falls Bridge Commission. The event has been in the planning stages since January and involves about 150 volunteers.